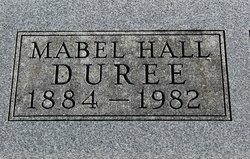 When Mabel Hall-Duree was born on May 15, 1884, in Appanoose, Iowa, her father, Amos, was 43, and her mother, Mary, was 29. She married Robert Otis Duree on February 28, 1910, in Adams, Iowa. They had one child during their marriage. She died in November 1982 in Centerville, Iowa, at the age of 98, and was buried there. Mabel is 44 degrees from Graham Chapman, 29 degrees from Janet Wild and 19 degrees from Henry VIII of England on our single family tree. Login to find your connection.